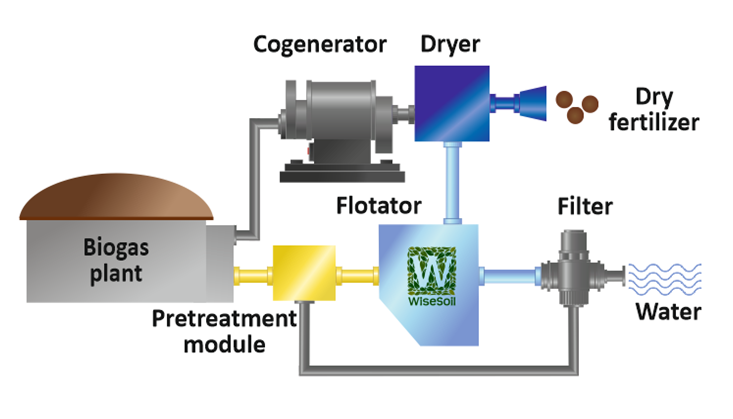 WiseSoil effluent dewatering system increases efficiency of biogas plants by producing clean water and dry fertilizer instead of wet digestion products. 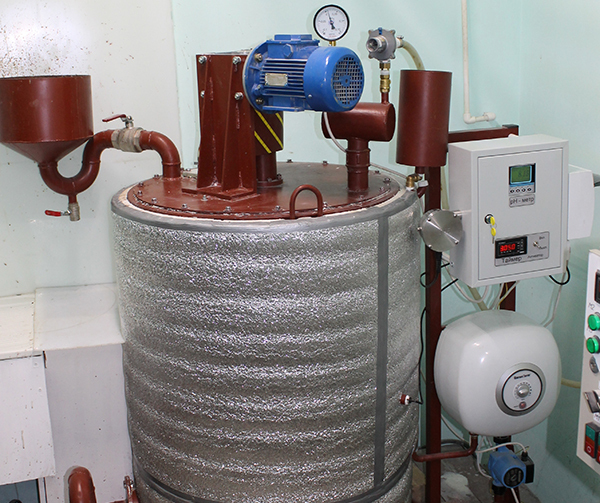 This new low cost, energy-efficient, green and easy to maintain technology enables owners and operators of existing biogas facilities to avoid paying recycling fee for substrate, produced by biogas plant, and to produce dry organic fertilizer and safe to discharge and reuse water instead. 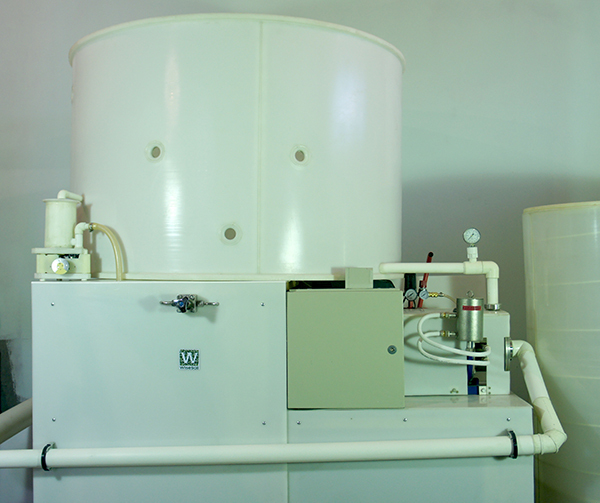 WiseSoil effluent dewatering system technology is based on conventional Dissolved Air Flotation (DAF) technology. Addition of microbubble and ultrasonic generators to conventional DAF unit significantly decreased bubbles size and simultaneously increased bubbles lifetime, surface area and solubility. As a result, WiseSoil dewatering system removes suspended solids 2.5-4 more efficient, providing longer filters life. Effluent from our own-developed biogas plant was used (pictured right). Dewatering system produces a high quality organic fertilizer product with mineral content of 5% N, 5% P, 8% K, and 10+% Humic content (see table below). System processes excessive nitrogen contained in animal manure, thus solving the Nitrogen runoff problem. Moreover, system consumes only 100 kWh for drying of 1 ton of nutrients, recovered from raw product (compared to 2000 kWh if thermal drying is implemented). an opportunity to increase your market share with WiseSoil systems additional value compared to convenient organic waste treatment technologies. Owner of the biogas plant? improve plant economic efficiency by 50-80%. Our main sales channels are plant suppliers and integrators, which currently provide maintenance and supply equipment to anaerobic digestion plants operators. We are developing our distribution network globally. So far, LOIs have been signed with the following distributors: Dufonev CZ, Agrikomp, Doranova.